Mohamed Salah scored a hat-trick as Liverpool moved top of the Premier League with a comprehensive 4-0 victory at AFC Bournemouth. 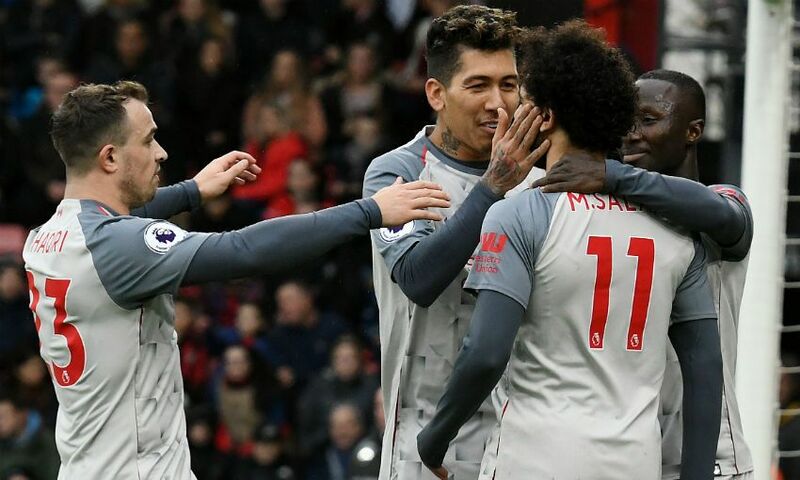 The Egyptian struck in both halves of Saturday’s match at the Vitality Stadium to extend the Reds’ unbeaten start to the top-flight season to 16 games and take them above Manchester City - at least temporarily, with Pep Guardiola’s team meeting Chelsea later in the day. An own goal by Bournemouth captain Steve Cook made it 3-0 to the visitors with 22 minutes remaining, before Salah’s audaciously cool solo effort rounded off the scoring in a consummate away performance by Jürgen Klopp’s side. Klopp again opted to make multiple changes to his XI, with five alterations from the midweek win at Burnley. Andy Robertson, Fabinho, Georginio Wijnaldum, Salah and Roberto Firmino all started, while Sadio Mane was fit enough for the bench following his foot injury. The No.10 came off the bench for the final 25 minutes. On the occasion of his 500th Premier League appearance, James Milner played at right-back for the Reds and was captain. A double nutmeg by Naby Keita - who started on the left of Liverpool’s 4-2-3-1 formation, with Firmino central and Xherdan Shaqiri on the right behind Salah - on Simon Francis and Jefferson Lerma was the highlight of an otherwise uneventful start to the game. Shaqiri saw a 13th-minute free-kick deflect wide off Charlie Daniels in the wall, before the Swiss created Liverpool’s first meaningful chance by clipping a pass over Nathan Ake for Salah. The No.11, though, sliced his right-footed shot off target. Cherries striker Josh King dragged an attempt wide midway through the half, and Alisson Becker was called into action to palm David Brooks’ effort behind as the hosts threatened. However, the opener would belong to Salah, who linked up well with Firmino and reacted quickest to bury the rebound after Asmir Begovic had spilled the Brazilian’s speculative long-ranger. 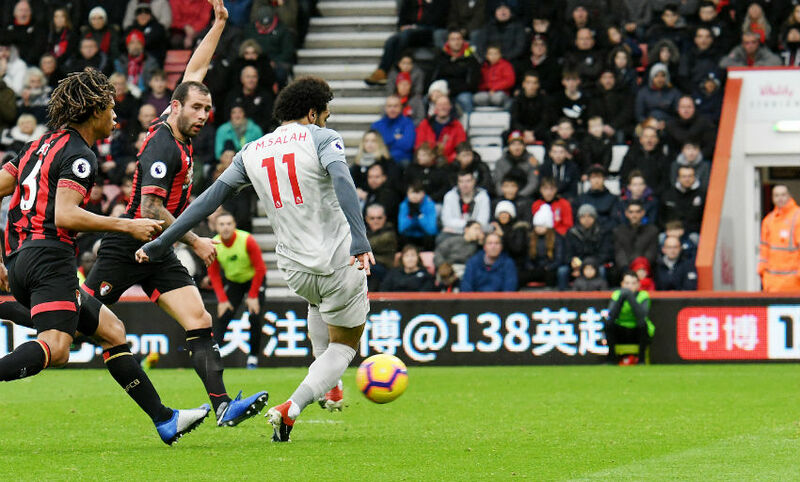 A spell of Bournemouth pressure followed Salah’s 10th goal of the season, but Liverpool navigated their way to the interval with their lead intact. It took just three minutes of the second period for that advantage to be doubled. In trademark style, Firmino stole the ball just inside Bournemouth’s half and fed Salah. The forward charged towards goal and stayed on his feet as Cook attempted to trip him, before coolly dispatching a precise finish into the far bottom corner. From there, it felt like a question of how many more goals a hugely impressive display would yield for Klopp’s team. Cook inadvertently scored the third by slicing Robertson’s cross into his own net with 68 minutes on the clock, before Salah completed his hat-trick in clinical fashion. Substitute Adam Lallana hooked the ball in behind the Bournemouth backline and Cook, panicked by the Egyptian’s speed, under-hit his attempted sliding back-pass to Begovic. Salah did the rest, twisting and turning his way past the goalkeeper not once but twice before slotting in to add gloss to another Liverpool win.